UTG Pro is a division of Leapers, Inc., which manufactures an incredible variety of technologically advanced firearms parts and accessories, many of which are available on sale now at AR15 Discounts. Leapers Inc. began as a garage business in 1992, and have since expanded to become one of the most popular dealers in the United States firearms industry. In 2012 they began to sell their AR15 products internationally. Claiming the motto, “The Best Never Rest,” Leapers Inc. started the UTG PRO line of “Made in USA” products in 2009. These products range from bipods and ring mounts to tactical armor. AR15 Discounts currently offers UTG Pro handguards in several sizes. 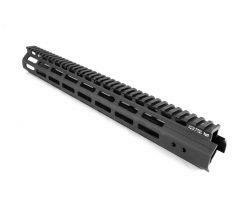 Below, you’ll find the UTG PRO M-LOK™ AR15 Super Slim FF Handguard in 13”, 15”, and 17” versions. Finding a handguard that delivers such value at this price point is a difficult task indeed! 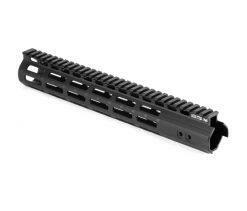 Designed and made in the USA, the UTG PRO M-LOK™ AR15 Super Slim FF Handguard offers incredible value because of the following features: super lightweight build with 37 Slot Picatinny Top Rail, flush fitting and ample space for optics and other accessories, integral anti-rotation tabs for accurate alignment, and ergonomic octagonal profile with grooved surface for a solid, comfortable grip and seamless handling. Installation instructions, barrel nut wrench, and additional installation tools and accessories are all included. So what are you waiting for? Get your UTG Pro Handguards right here at AR15 Discounts and save! You’ll also get free shipping on orders of $50 or more.